This was supposed to be a surprise present, but if I don’t name the recipient, it might still be a surprise… I have been working on this on and off for more than 7 months and I just keep finding more to do on it. I think I am in the home stretch. I have the back and binding picked out, just need some of that valuable “time” that is so scarce these days. I did a rotten job of measuring. I just made some little house and sashed them willy-nilly. Currently it is 85″ wide and 74″ long. I think I might have to add another tiny row of houses on top to get it a smidge longer. I used some of my hoarded Obama fabric, which I think the recipient might love. I still need to add some chimneys and front doors here and there. I think I may never feel finished on this one, I will just have to give up at some point! This red and pink house might be my favorite, I just love the couch! Poor baby will never get to sleep with all these polka dots! My favorite part is the tree trunk. I think the rainbow thread and the free motion quilting really worked out nicely. It is a skinny twin size quilt, only 48″ wide, but it is going on a day bed, so it works out very nicely. I pieced out two other backings for this quilt, one of them I even sewed before rejecting. But in the end I am so, so pleased with how well the lions match. I even managed to get my label on in time for the meeting! ten years ago I was in my final semester of undergrad. I did an amazing study abroad program and had 2 roommates. I hit it off with Christy and we spent a lot of time sitting in our room being “grandmas” according to our 3rd roommate. She lent me the first Harry Potter book to read and inspired me to try to knit (um, that didn’t stick, sorry). I, in turn, taught her how to do black and white film developing. I never really continued with photography as a hobby after that semester, meanwhile, Christy has turned it into a career. And godammit she is freakin’ good at it! Really click that link- you won’t regret it. I am almost embarrassed to put up my pictures! I got to see her after too many years apart this weekend and we compared husbands and dogs and babies… and I brought her this for her toddler. I won’t lie, It was hard to give up. I love every little bit of it! even the penguins on the back! 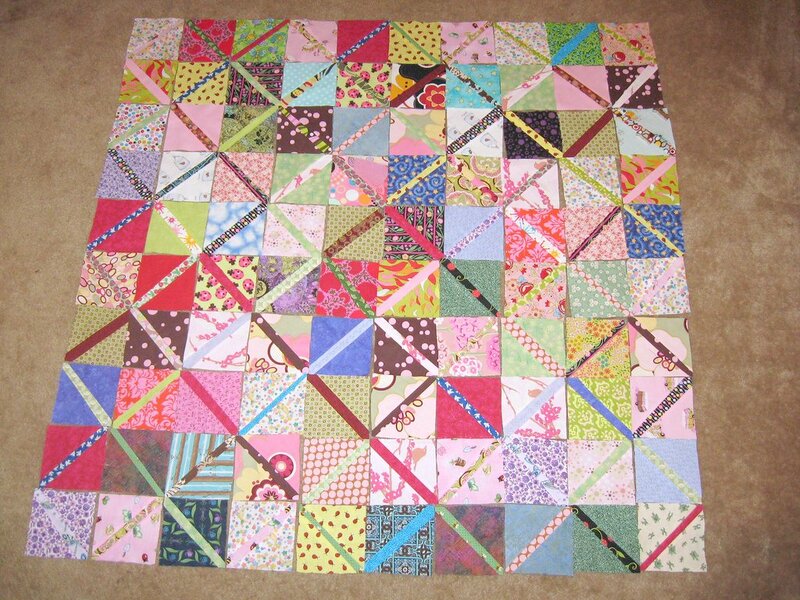 I am trying to make a baby quilt in a hurry for an old friend and her darling baby who we are seeing on vacation next week. It is fun revisiting some of these fabrics, I have had some of these scrap triangles for ten years, just waiting for the right project. It felt like I had pulled out millions of triangles, but when I laid out this pieced top I was disappointed in the smallness. In my mind’s eye this was going to be big enough for a toddler bed but it is currently too small to be a baby quilt. Even though the triangles were mostly half of a 5.5″ square the finished squares ended up being 4″ . I think I have to add at least 2 rows to the long side. And a ginormous border. Of red? of white? of a rainbow polka-dot? 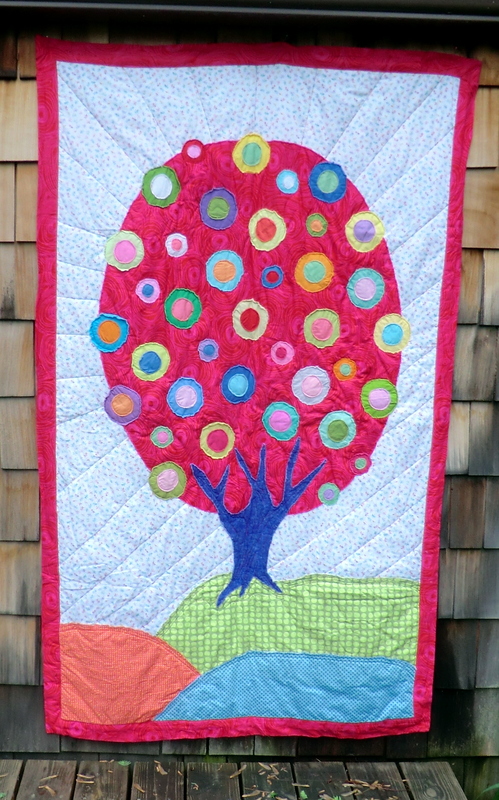 I loved doing this pattern with Lauren’s quilt, but those triangles were bigger and maybe more forgiving? I am having a hard time making clean points with such small triangles. Such is the nature of slightly wonky scraps. I was stumped on what the binding should be for a while but ran across this lovely polka dot satin at the Joann’s and made half a yard into just the right amount of binding. I added a stripe on the back in the dead center. The minkee came up just a smidge short and this is how I made up the 3 inches I needed to match the front. In full disclosure I should tell you I did not use any batting in this quilt. Strange, right? Well, it was very intentional. I noticed that we had not been using the baby quilts I had for miss d. but instead using the store bought minkee blankets, and I realized the reason was the quilts I had made, even with thin cotton batting, were just too bulky to use. So, this is just fabric and minkee and it feels like just the right weight, better for traveling from room to room and snuggling with at naptime. There is no telling how long it will take me to get these squares made into a quilt. But I wanted to share how I spent my last days of pregnancy. These are made from all my skinny scraps. I confess I separate my scraps into stripes, squares and triangles. A bit of my OCD showing. dear god that is an original title. almost as good as “vanilla ice cream, in a bowl” . Anyway- I finished the pinwheel quilt last night. This darn quilt has been in process for way too long. I think I made the pinwheel squares more than 8 months ago. But the flip side of this is I am finishing all the stuff that has been stacked on top of my fabric stash- preventing me from making new stuff. I did something wretched to my shoulder and cannot wait for the day I can use both hands to drive, type, sew etc. working on a unique back for this, stay tuned. I had planned the last few weekends full of events to distract myself from being all alone at the house but that all seemed to fall apart this weekend. I taught a sewing class on friday night and then I had 2 days that stretched out in front of me with no real plans except to dog sit for a friend. It was lovely. I finished my scrap quilt- Ta- Dah! rainbow thread, although you can barely tell. I polished all the silver my mom and aunt have given me and I had so graciously stored in a cardboard box. I sorted through it and transformed a little used cupboard into a display. Which I then took a zillion pictures of – all of which looked terrible. So instead, a picture of one untarnished piece and some hydrangeas I borrowed from the abandonded house on my street. Okay, more about this silver polishing; I ordered this plate called “Metal Brite” from the fabulous internet. When you put it in a sink with hot water and Calgon Water Softener it removes tarnish from all your silver, brass, ect. It arrived and I realized that it was just a piece of aluminum. I work in the office of a wood and metal shop so I decided I would try this trick with a regular piece of aluminum from the metal shop. Surprise! It worked like a charm. So I am returning this $20 piece of aluminum (which is actually worth less than 15 cents) and using the big chunk I brought home from work with the $6 box of calgon water softener. SO- lesson learned- ignore the lure of the miracle product and just go to home depot and pick up a chunk of aluminum. Much faster than silver polish, and it gets all the hard bits too! I awoke on Sunday and felt the need to go to IKEA, a place where I can wander for hours. I have big plans on making a lovely desk under this living room window. But couldn’t find any desks that fit very well. I did however find this headboard. I nearly took it off the display wall to carry it home with me. But I just bought my bed last year and spent a good while painting it white and attaching the new knobs. And my guest bedroom has a slanted ceiling which is too short for this 5′ gorgeous headboard. Maybe I can make it into a garden gate. Or maybe a tomato cage. But it might rust. Or I could hang it in the living room. Would that be weird? A head board just attached to the living room wall. Oh the dilemma. A quilt for me this time, this is the first hundred squares for my scrap quilt. I think I need another 125 to make it a full quilt top, 15 rows 15 columns. Although I suspect I will give up and make a wide border. Maybe another 70 squares for 13 rows 13 columns. I never realized how many pink scraps I had. All of them are from the baby dress making but I genuinely though I had been making a wider color variety. I love all the green but I think I will make an effort to put in more blue.